In the past, shrubs were largely used in the back of the garden, but today with their distinguishing characteristics including colorful foliage and flower displays, shrubs are now featured as focal points in today's landscapes. The shrubs we offer were selected for their desirable characteristics and garden performance. There are a number of factors to consider and procedures to follow that will enhance the success and performance of your new shrub. We have compiled some brief summaries of areas that will improve the production and longevity of your new plants below. Upon receiving your new shrubs, it is important to open the shipping box(es) immediately. Carefully remove all packing materials and containerized plants from the carton(s). Do NOT keep the plants in the shipping boxes as this will reduce plant quality and may lead to plant disease or death. If the potting mix is dry upon arrival, apply water to the containers until the root zone is thoroughly moist. When possible, plant your new shrubs within 1-3 days after they have been received. If it is not possible to plant them within this time period, keep them in an area that provides some degree of shelter from the natural elements (sun, wind, rain, etc…) until they can be planted. There are several factors to consider when choosing shrubs for your landscape. The most important consideration is the environment that you will be planting them in. Several environmental factors that may affect the performance of shrubs include the amount of sunlight (full sun, partial shade, shade) the site receives, the moisture characteristics of the site (wet or dry), and the temperatures they are going to be exposed to throughout the year. Each shrub performs best when it is planted in its preferred environment. Planting shrubs in locations with inadequate conditions will greatly reduce their appearance, performance, and longevity. For example, planting a shrub with a full sun requirement in a location that has full shade will reduce the appearance of the plant, decrease the number of blooms produced, and the flowering will usually be delayed compared to the same shrub planted in a sunny location. Also consider the USDA Hardiness Zone designation of each plant before purchasing and planting shrubs into your landscape. This provides an indication as to where each shrub is likely to survive the winter months. Use USDA Hardiness Zone recommendations as guidelines as many factors such as the actual snow cover and moisture levels of each site will also affect a plants ability to withstand cold temperatures. For improved success, choose varieties that are known to perform well in the type of area you desire to plant them in. When planted in a suitable environment, shrubs will prosper and provide you with years of relatively maintenance free beauty. There are numerous ways to utilize shrubs in the landscape and around the home. One of the original and still common uses of shrubs is to hide the foundations of buildings. They can be used to create privacy fencing or as hedges to separate or enclose sections of landscapes or adjacent homes. Shrubs can be used as accent plants placed near prominent landscape features or to add emphasis to that feature. Varieties with significantly showy attributes can be featured as specimen plants or focal points in the landscape. Additionally, shrubs are commonly featured in mass plantings or as containerized patio plants. In the landscape, shrubs combine well with annuals, perennials, and trees, attract birds and wildlife into the garden, and provide structure to winter landscapes. In general, most shrubs perform best in sites with well drained soil. The drainage in poor soils can be improved by adding organic matter like, compost, leaves, peat moss, or aged manure. For new landscapes, incorporate 4 to 6 inches of organic matter into the soil before planting. When transplanting new shrubs into an existing garden, incorporate a few handfuls of organic materials into the hole prior to planting. It is important to consider the mature size of the plant and their purpose in the landscape when deterring how much space to allow between the plants. Remember to allow adequate space around doors, windows, and walkways. With hedges, the spacing between the plants also determines how quickly they grow together. In general, dig a planting hole at least 50% wider then the size of the container you are planting. Larger sized holes should be dug when you intend to mix in organic material. Carefully remove the plant from the container by holding one hand over the top of the pot and turn the container upside down. Gently tap the bottom of the pot to loosen the root zone from the container and gently pull the pot away. If the container does not easily come off, it may be necessary to squeeze the container until the plant comes out of the pot. Next, place the shrub in the hole so the top of root ball is at or slightly above the top of the hole. It may be necessary to remove the plant and place a little soil back in the bottom of the planting hole and retry aligning the top of the hole with the top of the root ball. Once the plants are at the proper height, fill in the planting hole with soil, gently packing the soil around the roots and being careful to not overly pack or compact the soil around the new planting. After planting, it is important to water them well. For the first couple of weeks or so, it is important to keep the soil moist, but not soaking wet. Keep in mind that many new plantings do not perform well or even die because they are either over- or under-watered. Once they are established, most shrubs can tolerate less moisture. To optimize performance, improve plant appearance, and ensure longevity there are a few maintenance activities that gardeners should consider. Most shrubs can be grown successfully with relatively little maintenance, while other shrubs will require more work to keep the in good condition. It is important to provide sufficient irrigation, particularly the first growing season after planting container grown shrubs. 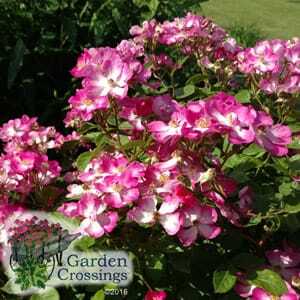 This is especially important for shrubs transplanted in the spring which have not become well established by the warm summer months. Although most shrubs are not considered to be 'heavy feeders', it is important that they are produced with an adequate nutrient supply. Mulching the landscape beds with compost each year often supplies an ample supply of nutrients. In beds covered with bark mulches, it is recommended to fertilize once or twice per year with a general purpose fertilizer. Gardeners commonly apply a controlled release (slow release) fertilizer at the beginning of the growing season or make 2 to 3 applications using water soluble fertilizers throughout the spring and summer months. Placing 2 to 3 inches of organic mulches (bark chips, pine needles, straw, or slightly decomposed or shredded leaves) around the shrubs will help retain moisture in the soil, decrease the emergence of weeds, and adds organic materials to the soil as they break down. Avoid apply thick layers of mulch against the base of the shrub as this often promotes shallow roots, disease, and pest injury. Pruning shrubs will help them maintain an aesthetic shape, size, and appearance. The proper time of the year to prune them varies by variety. Shrubs that do not produce showy flowers can be pruned most any time of the year except late summer. Late season pruning softer results in a new flush of growth that may not harden off in time for winter and is likely to become damaged during the winter. For flowering shrubs, the best time to prune them depends on whether they flower from old wood or new wood. Shrubs that flower on old wood produce flower buds in the year before flowering occurs. It is best to prune these plants just after flowering occurs so that new flower buds can be made on this season's growth. Shrubs that produce flowers on new wood can be pruned anytime after they flower to just before they flush growth in the spring.